Several downtown stores have put up signs and placards declaring: "This is Our Town" and "If Equality and Diversity Aren't for You, Then Neither Are We." 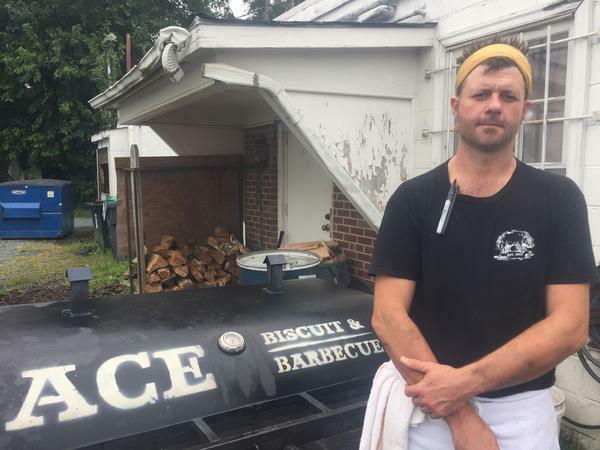 Chef/owner Brian Ashworth over the weekend ran neo-Nazis out of his barbecue restaurant, Ace Biscuit & Barbecue, in Charlottesville, Va.
"That is just extremely disappointing that he would coin the term such as the 'alt-left' and try to place blame in some form or fashion on individuals, who according to clergy members, were saving their lives," Bellamy says. Standing near the disputed statue of Confederate Gen. Robert E. Lee in the same park where Saturday's rally erupted in violence, Bellamy says Trump's message encourages hate groups to hide behind the First Amendment. "So if these individuals want to continue to come back, that's on them. But they're not welcome here," Bellamy says. "I hope they got that message loud and clear." A small group of neo-Nazis got that message at a local barbecue joint, Ace Biscuit & Barbecue. Owner Brian Ashworth says he had a confrontation with a group of customers on Sunday. "One of them started putting Hitler salutes out there and that's when I told them they had to go," Ashworth says. He's angry they chose Charlottesville as a battleground. "If they're affiliated with a group that's associated with lethal violence or violence of any kind, they're not welcome here," Ashworth says. Downtown, many restaurants and storefronts along an 8-block pedestrian mall closed shop altogether on Saturday, the day of the rally. "It's been devastating," says Joan Fenton, who owns a gift shop and women's clothing store on the mall. She's head of the downtown business association, and says the biggest fear is that people will be afraid to visit. "This was like a little invasion of people who have left town, but as a result people think maybe they shouldn't come to Charlottesville," she says. "That's not who we are." Mike Rodi first put one in the window of his restaurant, Rapture, before a KKK rally earlier this summer. "If people were going to come out in support of the Klan they needed to know upon walking into my restaurant: We do have diverse customers; we do have diverse employees," Rodi says. "If they are going to have a problem with that, they shouldn't even step inside." Rodi's restaurant is on the corner where a car plowed into counterprotesters. He says it feels like the city is under siege. "My hope is a lot of people wake up and say wow, 'What did we do?' " Rodi says. "And that any further calls to action by these kinds of groups will result in diminished return." But Rodi says he fears President Trump's comments will only serve to embolden hate groups, making it easier for them to get their next permit to demonstrate in Charlottesville. A public memorial service will be held for Heather Heyer today. She's the 32-year-old woman who was killed when a man rammed his car into counterprotesters in Charlottesville last weekend. President Trump said yesterday, he's heard Heyer was a fantastic person. But he also blamed the counterprotesters, in part, for stoking the violence, calling them the alt-left. Community leaders say his remarks are a setback, as NPR's Debbie Elliott reports. DEBBIE ELLIOTT, BYLINE: After Trump's remarks, Charlottesville Vice Mayor Wes Bellamy had to control his anger. He says the president is showing where his loyalties lie. WES BELLAMY: That is just extremely disappointing that he would coin a term such as the alt-left and try to place blame, in some way, shape, form or fashion, on the individuals who, according to clergy members, were saving their lives. ELLIOTT: From the same park where Saturday's rally erupted into violence, Bellamy says Trump's message encourages hate groups to hide behind the First Amendment. BELLAMY: So if these individuals want to continue to come back, that's on them. But they're not welcome here. I hope they got that message very loud and clear. ELLIOTT: A small group of neo-Nazis got that message at a local barbecue joint. BRIAN ASHWORTH: Now, this is my beef brisket. I just flipped them over. I start them on the fat cap side to render some of the fat out. ELLIOTT: Brian Ashworth owns Ace Biscuit & Barbecue. He had a confrontation with a group of customers on Sunday. ASHWORTH: One of them started putting Hitler salutes out there to another one of them. And that's when I told them they had to go. ELLIOTT: Downtown, many restaurants and storefronts along an eight-block pedestrian mall closed shop altogether on Saturday, the day of the rally. Joan Fenton has a gift shop and women's clothing store. JOAN FENTON: It's been devastating. ELLIOTT: Fenton is head of the Downtown Business Association and says now she fears people will be afraid to visit. FENTON: This was like a little invasion of people who have left town. But as a result, people think maybe they shouldn't come to Charlottesville. And that's not who we are. ELLIOTT: Several downtown stores have put up signs and placards declaring, this is our town, and if equality and diversity aren't for you, then neither are we. 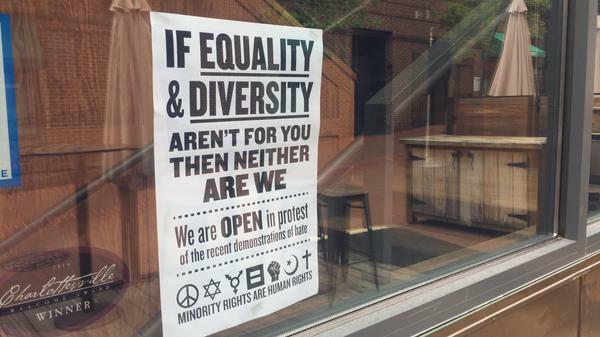 Mike Rodi first put one up at the window of his restaurant, Rapture, before a KKK rally earlier this summer. MICHAEL RODI: If people were going to come out in support of the Klan, they needed to know, upon walking into my restaurant, we do have diverse customers. We do have diverse employees. And if they're going to have a problem with that, then they shouldn't even step inside. ELLIOTT: Rodi's restaurant is on the corner where a car plowed into counterprotesters. He says it feels like the city is under siege. RODI: My hope is that a lot of people wake up and say, wow, what did we do? And that any further calls to action by these kinds of groups will result in diminished return. ELLIOTT: But Rodi says he fears president Trump's comments late yesterday will only serve to embolden hate groups, making it easier for them to get their next permit to demonstrate here. Debbie Elliott, NPR News, Charlottesville, Va.
(SOUNDBITE OF BALMORHEA'S "BALEEN MORNING") Transcript provided by NPR, Copyright NPR.